In the affair over the refusal to admit non-Jews to the country club in Hochav Yair Tzur, you see the realities of Israeli social apartheid and the ingrained racism in Israel. Structurally Apartheid already exists in relation to residence, employment and education. When an Israeli Arab applied to join the club, which has good social facilities including a swimming pool, he immediately ran into opposition. Only a small Jewish child could had no objections! Those with long memories will remember the bar on Jews joining golf clubs and similar institutions in this country and the United States. Most of these have now disappeared but in Israel Jewish local government strains every muscle to keep Arabs out. 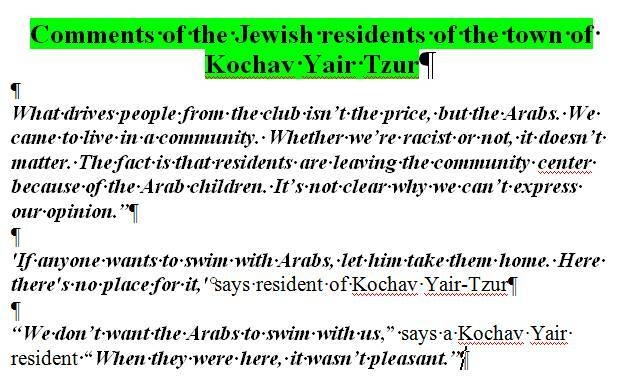 Below is an editorial in Ha’aretz concerning the Jewish town of Kochav Yair Tzur. In order to keep Arabs out of its country club, the Council kindly amended its laws to distinguish between its own residents (all Jewish) and outsiders. Nominally this meant Jewish as well as non-Jewish non-residents but in practice, Jews from outside the town are allowed in. Although Israel has laws banning discrimination in services and goods, just as Britain does. However it is a law that has as many holes as a colander. The Knesset kindly passed a law allowing discrimination between a town’s residents and non-residents. In Israel this is a cover for allowing discrimination against Arabs. 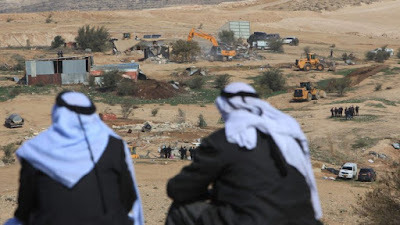 Ha’aretz gives the example of the Bedouin village of Umm al-Hiran, which Israel demolished in January to make way for the Jewish town of Hiran. 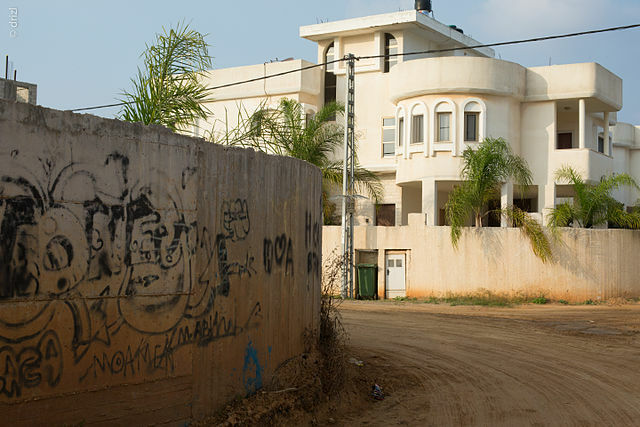 When this issue came up in the High Court the Justices pretended that the present inhabitants of Umm al-Hiran could live in the Jewish town when it was built. Now it turns out that they can only do so if they are believes in the Torah or a Jewish Israeli! One suspects that having found legal fictions in order to disguise the ongoing discrimination against Palestinian Israelis for 70 years, the High Court is not going to reconsider its verdict because of changed circumstances. This is why Israel’s High or Supreme Court (the same thing) cannot be seen as a neutral body but is one imbued with the principles and logic of Zionism. Israel has never ceased to demonstrate creativity when it comes to discriminating against Arab citizens of the state. As readers may recall, the state sought to evacuate and demolish the Bedouin community of Umm al-Hiran to make way for a new Jewish town called Hiran. In 2015, the High Court of Justice rejected Umm al-Hiran residents’ arguments against their eviction, asserting that the Bedouin would still be able to live in the planned Jewish town. Nor did the fact that the plan for the town included a Jewish ritual bath and a synagogue undermine the principle of equality, Justice Elyakim Rubinstein wrote. Even then, it was clear the court was regrettably turning a blind eye to the character of the planned town and of the agencies establishing it. And indeed, it now turns out that among the criteria for admission laid down in the bylaws of the Hiran cooperative association is one requiring an applicant to be “a Jewish Israeli citizen or permanent resident who observes the Torah and the commandments according to the values of Orthodox Judaism” (Tuesday’s Haaretz). In other words, not only is Hiran slated to be inhabited by Jews only, they must also be Orthodox Jews. This lie, which regrettably gained traction even in the High Court, is additional proof that the only correct and just solution to this affair is to allow residents of Umm al-Hiran to return to their land and live there in peace, rather than being dispossessed in favor of a Jewish town. Another “Jewish innovation” is an amendment to the law banning discrimination in selling products and services, or in admission to places of entertainment and public venues. Under this amendment, a local government can distinguish between its own residents and those of other towns without this being considered discrimination, if the distinction is intended to allow it to exercise its powers for the benefit of its own residents. This amendment may now play a role in a lawsuit against the town of Kochav Yair-Tzur Yigal and the organization that runs the town’s country club. To prevent Arabs from joining the club, its bylaws state that only residents of the town can join. But the fact that in practice, memberships were also sold to Jews who weren’t residents of the town, combined with many statements by residents and members of the town council, show the real intent behind this ban (Or Kashti, Haaretz, August 4). Both Hiran and Kochav Yair are examples of ugly discrimination against Israel’s Arab citizens. The justice system cannot close its eyes and legitimize such discrimination with legal hair-splitting disconnected from the situation on the ground. While Hiran is a town whose very establishment constituted a fundamental injustice, and therefore shouldn’t be permitted, the Kochav Yair-Tzur Yigal case merely requires forbidding discrimination and ordering that anyone who wants to join the country club be given an equal right to do so. There are still "portals" in the world that maintain our connection to the cosmos! For the past seven years the country club in the local council Kochav Yair-Tzur Yigal in central Israel has refused to accept Arab members. Yet the community’s Jewish neighbors were welcome to enjoy the club’s three swimming pools, fitness room, lawns and other facilities. Some 20 percent of the Lev Hamakom country club’s members are from the Tzur Yitzhak community and the West Bank settlement Tzofim, to the east of it. Following a petition filed by a resident of the nearby Arab village Tira against the club’s policy three years ago, the club recently decided to sanitize the ban: From now on, membership will be restricted to Kochav Yair-Tzur Yigal’s residents, who of course are all Jewish, while no outsiders, Jewish or Arab, will be allowed in, the local council decided. She finds nothing wrong with banning from the club anyone who doesn’t live in the local council. The residents of Tzur Yitzhak and Tzofim agree with her, perhaps because they have other ways of enjoying themselves in the summer. The idea that Jews and Arabs can share the same pool appears to many of them unacceptable. Dr. Ahmed Mansour, an ophthalmologist from Tira, petitioned the Lod District Court three years ago against Kochav Yair-Tzur Yigal and the organization operating the country club after his request to buy a club membership for himself, his wife – a physiotherapist in Tel Aviv’s Ichilov Hospital – and their small son was denied. The petition was submitted by the Association for Civil Rights in Israel. Mansour said in the petition that there was no swimming pool in Taibeh and Kalansua, the neighboring towns, while the pool in Tira only opens late in the summer. The court has debated the petition several times but hasn’t reached a decision. 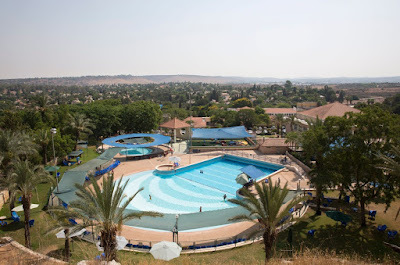 The petition cites a protocol of a council meeting in Kochav Yair-Tzur Yigal in 2010, before the decision was made to close the country club to outside residents. However, according to the document, Arabs comprised only 3 percent of the club’s members. After that meeting the council decided to close the club to anyone who wasn’t a resident of the community. 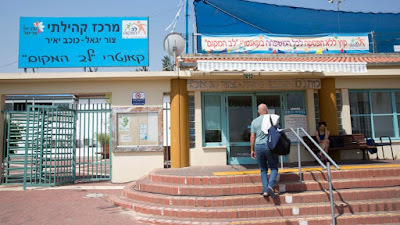 But later, probably due to the few members who joined, it was reopened to the residents of Tzur Yitzhak and Tzofim, whose children go to school in the local council. The council’s decision is based on “familiar patterns of segregation in residence and schools, and creates clear discrimination on the basis of nationality,” the petition says. However, this may not be merely a local issue. Over the years the state has participated in financing the country club, also through the Association of Community Centers. Following the amendment, the court instructed the parties to update their positions. If membership is available to anyone who is interested, it could cause an “overload.” In this case, limiting membership to residents only falls under the clause of “operating powers for the residents’ benefit,” they said. A non-resident may only enter the country club as a guest of a member who lives in the local council, they said. Residents of Kochav Yair-Tzur Yigal appear to agree with this. Only a little girl, still in her bathing suit, disagreed. “They don’t get in anyone’s way. Anyone who wants to should be allowed into the club,” she said. Some 200 families from Tzur Yigal and Tzofim are club members. 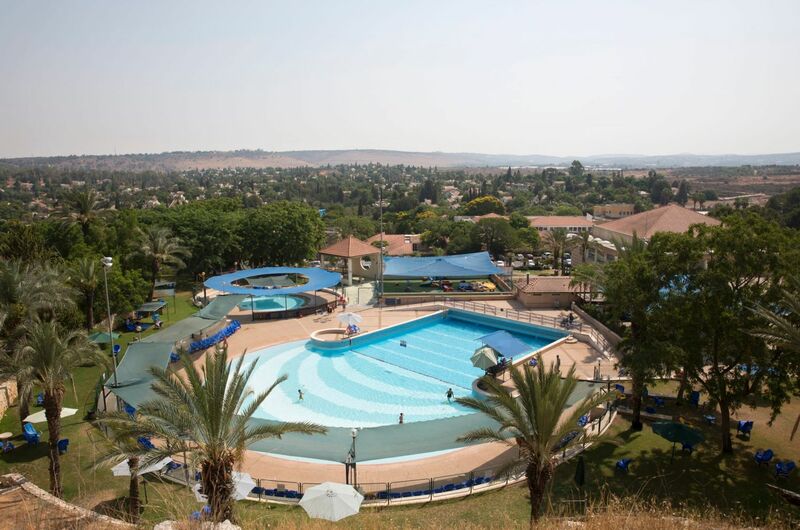 The manager of the country club wrote in a statement to the court that memberships are not sold to residents who are not members of Kochav Yair-Tzur Yigal. He told Haaretz that the decision went into effect on July 1. Last week, outside the country club, a Tzur Yitzhak resident said she and a few of her friends bought membership to the club that day. A person who called the club and said he lived in Tira also received details of the membership’s price.